I know that rhyme doesn’t make split pea soup sound very nourishing, but it runs a close second to lentils as my favorite new food find. I know for some the greyish-green color is more fitting for trendy glass tiles than soup, but the smooth, slightly sweet taste more than makes up for the odd tint and hue. 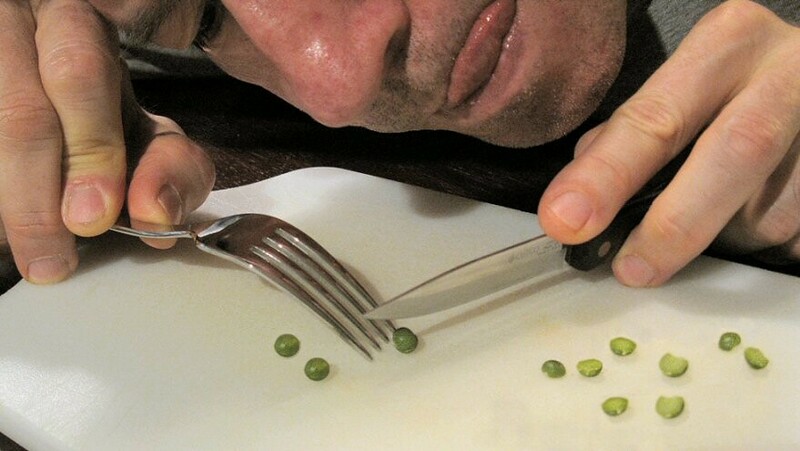 What I didn’t know until I did a little research for this article was how the peas came to be split in the first place. I imagined gangs of Greek women having pea parties where they sat around in huge circles with tiny little knives cutting peas in half, drinking ouzo and gossiping about the Andronikos. Opa! Nothing could be farther from the truth. (Actually, quite a few things could be farther from the truth, including the assertion that rap music is actually a viable musical form and that no one can tell the difference between real and fake Louis Vuitton luggage. But I digress…) Peas actually have a natural split and, once they are harvested and dried, can be separated mechanically. (Thank you, Wikipedia). No gossiping or sharp implements required. 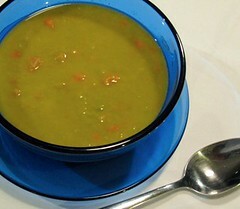 Split pea soup is high in fiber and protein and cooks up into the kind of comfort food that makes you wish you were sick so you could just lay around and enjoy slurping it without guilt. Heat the olive oil in a large pot over medium heat. Once it’s hot, add the onion and carrot and sauté until the onions are translucent, approximately 6 to 7 minutes. Add the broth, peas, salt, and pepper and stir to combine. Increase the heat to high and bring to a boil. Loosely cover and boil for 30 minutes. Add the packet of ham seasoning and the turkey ham. Reduce the heat to low, cover and cook at a low simmer for 30 minutes, stirring occasionally. Feel free to pump up the volume on the turkey ham (according to your taste) or use real ham (according to your nutritional inclinations). I find that the soup tends to cook down to a smooth texture so that puréeing it isn’t necessary. But feel free to pulverize away. So let’s dish up a bowl of green and gooey goodness, sing “Kum Ba Yah,” and visualize whirled peas. In my most recent soup recipe post dated almost a year ago (for Minestrone, actually), I stated that it was going to be the last in my series of soup and stew recipes until I found another recipe I couldn’t resist. Good news (at least for me) – that finally happened. If you’ve read any of my previous soup or stew posts here on Live from the Lizard Lounge, you know that my kitchen is in a constant state of homemade soup production. I take soup and a container of cantaloupe to work every day for lunch. It’s portable, filling, healthy, and can be easily eaten at my desk (cantaloupe is another super food). Since I finally perfected my current rotation of liquid nourishment varietals, it was time to extend my recipe repertoire and toss a couple of new players into the mix. Today’s recipe features my newest star performer – the gentle lentil. Lentils are one of the first cultivated foods. They also contributed to the downfall of Esau, grandson of Abraham in the Bible, who traded his rights as the firstborn son to his wily brother Jacob for a bowl of lentil stew. Although this was a decision that ultimately benefitted Jacob much more than Esau (Jacob went on to become the father of all Jewish folk, the people chosen by God, and Esau, of course, did not), after my first bite of lentil soup, I could kind of understand the temptation. Although I could actually write an entire post on the nutritional value of lentils, I’ll just be content with a few sentences. Lentils lead the pack in protein, iron, and vitamin B1, while trailing far behind in fat (virtually none) and calories (hardly any). But where this little nutritional gem really hits a home run is in the fiber department. A cup of lentils gives you 62% of the recommended daily value of fiber. Now, I know that fiber is probably one of the most unglamorous topics going (that, and the current presidential race), but if one has any sort of issues with cholesterol, one could not go wrong adding lentils to one’s diet. Lentils are high in both soluble and insoluble fiber. Soluble fiber forms a gel-like substance in the digestive tract that snags bile – which contains cholesterol – and ferries it out of the body. Insoluble fiber helps to increase stool bulk and prevent constipation. OK – ewww… But who knew something that tastes so good could do such nasty but necessary work. Lentils are kind of like the trash pickup guys of the vegetable world. So on to the good part – the recipe. Heat the olive oil in a large pot over medium heat. Once it’s hot, add the onion, carrot, celery and salt and sweat (the vegetables, not you) until the onions are translucent, approximately 6 to 7 minutes. Add the lentils, tomatoes, broth, and spices and stir to combine. Increase the heat to high and bring just to a boil. 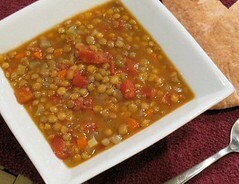 Reduce the heat to low, cover and cook at a low simmer until the lentils are tender, approximately 35 to 40 min. Unlike beans, lentils don’t have to be soaked and cooked beforehand – you can toss them dry right into the pot. The original recipe I found called for “grains of paradise” for seasoning. Good luck finding that; and if you do, be prepared to sell a kidney to afford it. After scouring the web, I found several sites that vowed that one could substitute ground ginger and pepper and get virtually the same effect. Some recipes call for using a stick blender to purée the soup toward the end, but I love the hearty texture of it, so no puréeing for me. So hang on to your birthright, grab a bag of lentils, and say hello to good health. After all, 8000-year-old Middle Easterners can’t all be wrong. Minestrone is basically Italian for “throw everything you have in a big soup pot”. In Slovenia it’s known as mineštra. In America, it’s called Campbell’s Chunky Vegetable Soup. There really isn’t a fixed recipe for minestrone. In the distant culinary past, it was always made with whatever was seasonal and on-hand, which can include any number and variety of vegetables, meat, pasta, or rice, and can range from thick and dense with very boiled-down vegetables to brothy with chunks of lightly cooked veggies. 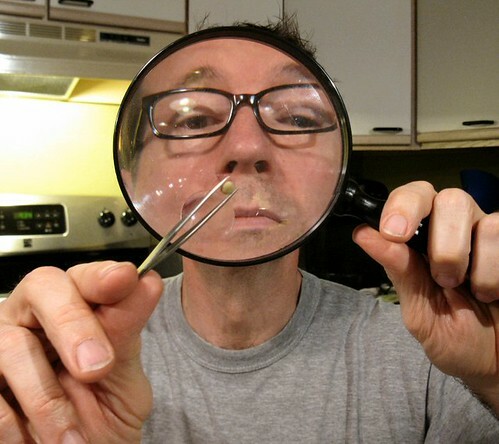 Below is the recipe I use, more or less (more – or less – on that under the thoughts below). Warm the olive oil in a large soup pot over med. heat. Add the bacon and cook for 2 to 3 min. Begin adding vegetables in the order presented above, up to and including the cauliflower, one at a time and cooking each addition 2 to 3 min. If you wish, you can prepare each one as the previous is added as opposed to preparing them all in advance. At this point, salt and pepper lightly, starting with about 1 t. salt. Add the tomatoes, stock, water, and herbs and bring to a simmer. Simmer gently for one hour. Taste for salt. Add the beans and simmer again for 15 minutes. The soup should never be watery or thin but rather substantial. 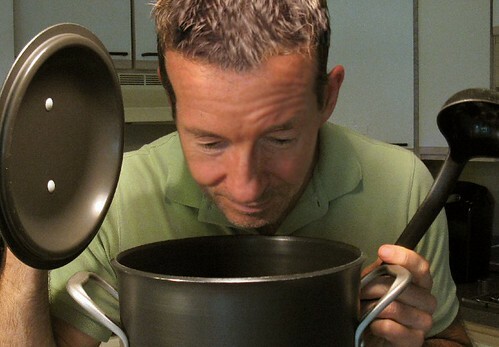 If it appears too thin, continue to cook it, uncovered, until more liquid evaporates. Taste again and adjust the seasonings. 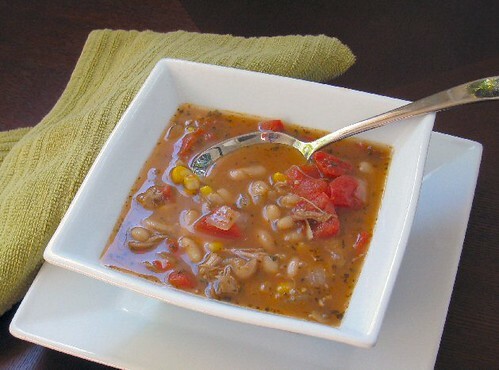 You can use chicken, vegetable, or even bean stock instead of beef (bean stock would make it pretty thick). I bought a container of beef broth by mistake one day and used it in the first batch I ever made – it has henceforth been my choice for this particular soup. 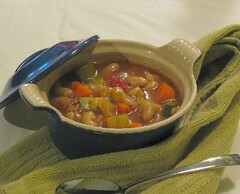 You can also substitute Great Northern beans for the cannellini. I will tell you, however, that the texture and flavor of cannellini is a perfect complement to this particular soup. They’re not easy to find dry, but worth the search. (Surprisingly, my local Walmart Supercenter is the only place I can find them.) You can also use canned if that’s all you can find. The ingredients above are pretty standard for minestrone; however, I didn’t have any cauliflower or potatoes on hand this time so I left them out (and didn’t miss them at all – there are enough guests at that party already to keep your mouth dancing). As long as you include tomatoes and the herbs, you’ll end up with something akin to minestrone. This is the last in my series of soup and stew recipes (at least until I find another soup and/or stew recipe I can’t resist). I encourage you to try some of these or wander through the internet and collect some of your own. 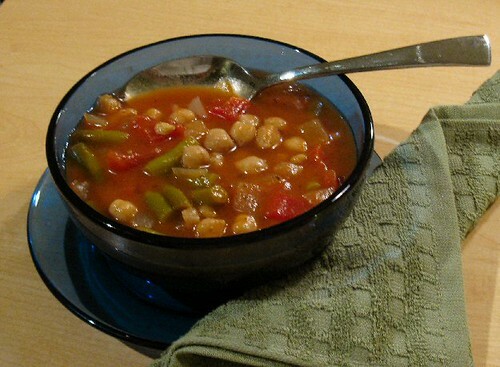 Soups and stews are some of the easiest and – depending on how you cook them – healthiest dishes to prepare. 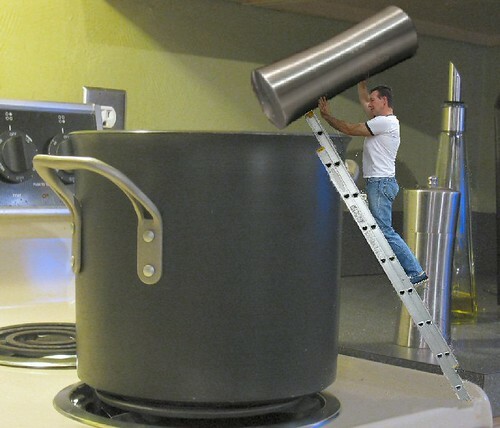 So grab a ladle – soup’s on! Although I wouldn’t recommend eating 7,500-year-old anything (! ), as previously noted here on Live from the Lizard Lounge I do whole-heartedly recommend beans as part of a healthy, well-rounded diet. Include some brown rice as the co-star, and you’ve got as complete a protein punch as can be found outside of a turkey leg. Saute the onion in the olive oil until translucent; add the spices. Cook 3 min. Add the garbanzo beans, tomatoes, and tomato sauce; simmer, covered, for 30 min. Add the green beans and cook 10 more min., seasoning with salt to taste. I always use dried beans when I cook whenever possible. A pound of dried garbanzo beans will cook up to be more than enough (use them all and don’t worry about the extra bean-age). If you prefer the convenience of “tinned” beans, use about three cans, but drain the liquid and rinse to get rid of as much of the sodium as possible. For an even heartier option, you can added cubed ham (or turkey ham if you’re more health conscious). Toss it in around step #2. This recipe makes a heaping-helping of stew. You can easily halve all the ingredients for a smaller batch or just freeze anything you can’t eat in a week or so in 1-gallon freezer bags. Recently, I shared my health- and budget-conscious adventures in the homemade soup and stew oeuvre. Continuing in that vein, on this week’s menu I’m serving Sopa negra de Frijol, or Black Bean Soup. They’re also a great source of cholesterol-lowering fiber – fiber that also prevents blood sugar levels from rising too rapidly after a meal, making these beans an especially good choice for individuals with diabetes, insulin resistance, or hypoglycemia. Gram for gram, black beans have the most antioxidant activity of the bean bunch. Overall, the level of antioxidants found in black beans is approximately 10 times that found in an equivalent amount of oranges, and comparable to that found in an equivalent amount of grapes or cranberries. So lower your cholesterol, your weight, and your heart attack risk today – eat more beans! Sauté the vegetables in the oil until tender, stirring occasionally (about 10 minutes). Place 1 cup of the beans in a blender and whirl until smooth. Pour into a large saucepan. Add the remaining beans, broth, tomatoes, vegetables, sausage, garlic, and cayenne pepper (basically, everything that’s left); stir until well blended. 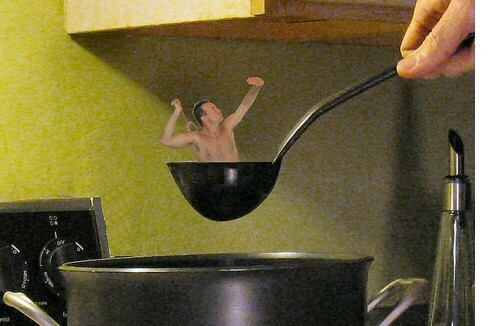 Bring to a boil on medium-high heat. Reduce heat to low, cover and simmer for 30 min. Serve with a dollop of sour cream and a sprinkling of sliced green onions or red pepper flakes. If you choose to go the cook-your-own-from-dried bean route (as do I), a pound of dried black beans will net a little over the required six cups (toss the whole lot in – it won’t disturb the balance one bit); if you’re more of the canned bean type, three cans should be just right. Stewed tomatoes come in all sorts of flavors; for the batch pictured, I used the ones flavored with green pepper and onion. Chili- or jalapeño-flavored tomatoes would also make for a nice kick. I use the 2/3 less fat turkey kielbasa – I can’t tell the difference between it and the artery clogging stuff. In the name of better health and (I admit it) frugality, I have become quite a connoisseur of homemade soups and stews. After I started down the path of better nutrition, I would have a Subway or Quiznos sandwich on whole wheat bread (without the cheese) and some melon or a side salad – healthier eats, granted, but still pushing $200-a-month; and of course there was all that bread, even if it was (purportedly) whole wheat. Over the past few months, I’ve finally wised up and discovered the pleasures of making a big ol’ pot of soup or stew and taking a goodly measure to work with me each day. Now, along about 11:15 I start counting the minutes until I can pop my Anchor 4-cup container of minestrone or black bean soup in the microwave and slurp myself into a soup coma. For the record, there’s barely a soupçon of difference between soup and stew – in fact, the ingredients are often the same. Soups tend to be a little brothier (not a word, but should be) while the liquid in stews leans more toward the end of the gravy spectrum. In the end, you cook all the ingredients together in a big pot and eat both with a spoon, so to-may-to, to-mah-to – it’s all good. Heat the olive oil in whatever you’re going to cook your stew in (I use an 8-qt. 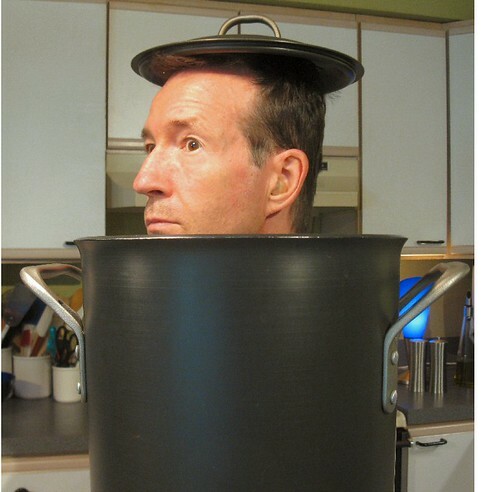 stock pot). Add the chopped onion and minced garlic and sauté for about 4 minutes, or until your whole house smells like sautéed onions (always a sure sign of doneness). Add the stewed tomatoes, chicken broth, corn, basil, and oregano and bring it to a boil. Add the chicken and put the lid on; simmer for about 20 min. Add the beans and simmer for about 10 minutes longer. Even though the recipe above pretty much uses canned everything (or tinned everything for all my readers across the pond), I cook my own dried cannellini (a half-pound of dried beans is enough) and reserve the stock when I boil my chicken instead of using canned broth. (The sodium count on canned food is frighteningly high.) Once I get adventuresome enough to stew my own tomatoes, I will probably do that as well. I typically use chicken breast, but I had a package of thighs on hand this time and used them instead. 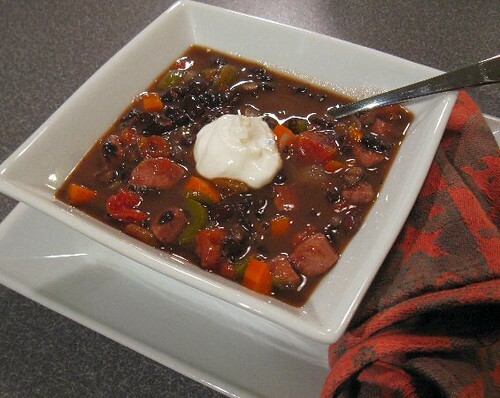 The stew is even better with dark meat and the cost savings more than made up for the small amount of extra fat. I used one tablespoon dried basil this time as opposed to a half cup of the fresh stuff. I would have preferred fresh, as you can’t beat a good chiffonade of fresh, peppery basil in a pot of soup of stew, but dried is what I had on hand. Trust me when I tell you that you just about can’t mess up homemade soup – don’t worry about measuring too carefully, put a little more of this or that in if you like this or that, and just lay off the salt until the very end. So don’t be afraid to stir up a little mélange of soupy goodness of your own. Your wallet and your waistline will both thank you. Eat oats – they’re good for you. The end. The soluble fiber in oats helps remove LDL, or “bad” cholesterol, while maintaining HDL, or “good” cholesterol, that your body needs. Oatmeal may reduce the risk for type 2 diabetes. A diet that includes oatmeal may help reduce high blood pressure. The fiber and other nutrients found in oatmeal may actually reduce the risk for certain cancers. Oats have tons of needed nutrients in them. Click here if you don’t believe me. Although I used to eat regular “old fashioned” oatmeal from the grocery store, recently a friend gave me a small supply of steel-cut oats, or “Irish oatmeal”. She might as well have given me a bag of crack – I couldn’t have become any more hooked. Most experts will tell you that different varieties of oats don’t vary much as far as nutritional value; the main difference is just the amount of processing they go through before you get ahold of them. Steel-cut oats are whole, raw oats cut into smaller chunks (groats) – very little processing. Old-fashioned (rolled) oats have been steamed and rolled flat, while quick oats are rolled oats ground into smaller bits so they’ll cook faster – lots of processing. However, health foodies like me will tell you that once you try steel-cut oats, you’ll never look back. Again, kind of like crack. Steel-cut oats take longer to cook and are more expensive than other types of oatmeal, but so is a good cup of coffee; and I do solemnly avow that both are totally worth it. 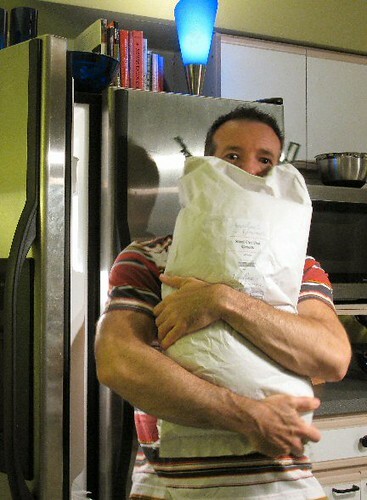 I actually order steel-cut oats in 25 lb. bags (seen in the picture above) purchased from a vendor on Amazon.com. (Is there anything you can’t buy on Amazon.com? That’s a rhetorical question; the answer, of course, is “No – duh”.) That bag will last me at least six months, so it’s totally worth it. I just keep a plastic cereal container filled in the cabinet and keep the rest in the freezer. Once the water has come to a gentle boil, I drop in 1/3 cup oats, give it a stir, turn the heat off, put the lid on, and go to bed. No, really. Easiest breakfast you’ll ever cook. The oats basically slow cook in the hot water. By the time the water has cooled off, they’re done. The next morning, I take the lid off and bring them back to a gentle boil, stirring occasionally, until they thicken a little. I then gussy them up with a couple tablespoons of ground flax meal (great fiber and loaded with Omega-3s), some raisins, a dollop of cimmanon, and some brown sugar (actually a blend of Splenda® and brown sugar, so it doesn’t take a lot), and put the lid back on for about 5 minutes while I scramble an egg. Once the egg is done (giving new meaning to the phrase “egg timer”), my bowl of porridge (cooked in my Mario Batali 2-Cup Essentials Pot, Pesto as mentioned earlier – sorry; it’s just a great oatmeal cooking pot…) is ready to warm me up and kick start my morning. Just note that you can gussy your own oatmeal up in a variety of ways by adding walnuts or pecans, dried cranberries, jam, fresh berries, or even butter or cream (if you’re not worried about your weight or your heart health). No matter how you serve it up, oatmeal is better’n sausage and biscuits any ol’ day.